Captaintreacherous’ latest adventure dismissed world-record holder Lucan Hanover. In a similar scenario, where Captaintreacherous is dueling in the stretch with one or two other late challengers, Lucan Hanover made steps that appeared he would catch his opponent by a nose or hair, and Captaintreacherous did what he always does—he looks at his foe from the side and takes the few extra steps needed for victory. The remarkable thing, then, about the American-National for soph-colt pacers at Balmoral on Nov. 9, was that Captaintreacherous paid $2.80 ($2.10, $2.10). Bee A Magician kept her win record spotless for the season, paying $2.10 ($2.10, no show wagering). But I Luv The Nitelife (the third of the Four Horses of the Apocalypse) went down in defeat after a long, grueling outside trip. 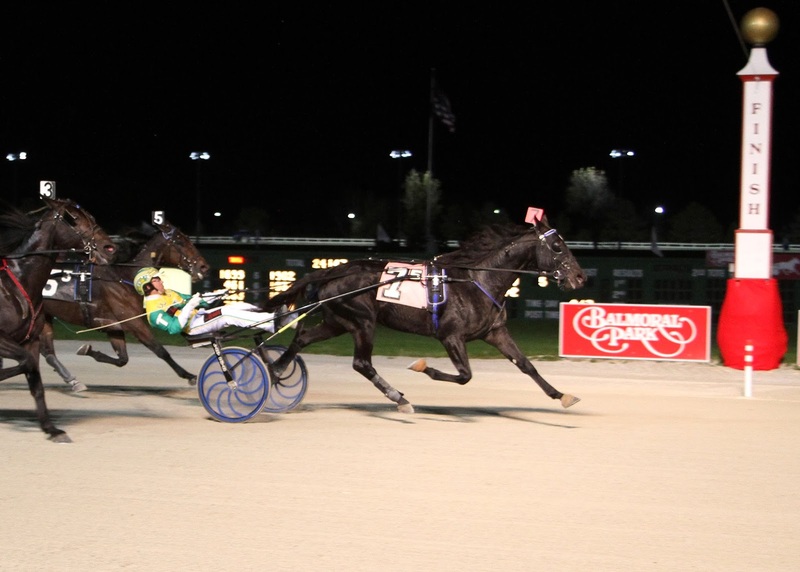 Still, in harness racing’s longest stretch, “Luv” only allowed Charisma Hanover to beat her by the slightest of margins. She finished second and paid $2.40, $2.10. Our grand achievement of the Am-Nats turned out to be Lindy’s Tru Grit (photo left from Balmoral Park) beating his glamour-boy trotting mates and paying $25.00 ($6.80, $4.80). Trotting mare Maven was second ($3.80, $3.20) and Mister Herbie third ($3.20) in the Am-Nat older Open trot, won by favorite Market Share. Frosh-colt pacer Wicked Business finished third at 24-1 ($8.80), while Southwind Silence and Sweet Lou, our other two Am-Nat choices, finished fourth respectively. Three obvious winners at Dover on Sunday, Nov. 10, were led by Sunshine Beach, paying $3 ($2.60, $2.20). We gave you the exacta using Emeritus Maximus ($4.80, $3.40), which paid $13.60. Then, most of the favorites won their Matron events. We had Nuncio, who paid $2.10 ($2.10, no show wagering) and Shake It Cerry won and paid $2.10 ($2.10, no show wagering). Second for us were Ms Caila J Fra ($3, no show wagering) and third was Summertime Lea ($2.10). Two of our offerings, So Surreal and Lyonssomewhere, scratched. The H2W results list across-the-board prices. Odds off to win appear only for place and show finishers. The annual Standardbred Horse Sale in Harrisburg, Pennsylvania, was reported a huge success, with yearling sales averages up. The optimism for the sport was riding high; we witnessed this in person on the first day of sales. A filly pacer, Bodacious, for instance, sold for $355,000. On day one of the yearling roster, 18 percent of the stock sold went for $100,000 or over. That included Way Bay Hanover at $270,000. He is a son of Somebeachsomewhere, a pacing sire whose yearlings were in great demand, and Katnss, by productive trotting sire Winning Credit, who went for $260,000. Of the notable racehorses sold, trotting mare Beatgoeson Hanover was the overall sales-topper, demanding $410,000. She was going to begin broodmare duties before being sold but sources tell us her new connections will bring her back to the track next season. Trotting stallion Knows Nothing went to the same connections, this one for $240,000. A frosh-pacing colt, McWicked got enough interest to be purchased for $210,000. One thousand one hundred and sixty-two horses sold for an average of $28,889. certainly a bettor’s friend, having delivered many a longshot while racing in the shadows of high-profile drivers. He is 37 and has driven the winners of more than $27 million. Plainridge Racecourse requested its current season end Thursday, Nov. 14. According to new legislation, a racetrack is allowed to reduce racing programs. Massachusetts is teetering on the brink of passing expanded gaming laws, which should have a positive affect on Plainridge, which has suffered greatly in business over the past few years and is the only harness track in the state.